Karan Johar Just Got Snubbed By A Bollywood Celebrity He's Working With! Karan Johar is best friends with most of the Bollywood celebs: Kareena Kapoor, King Khan and Alia Bhatt are just a few of them. You will always see the filmmaker and TV show host of Koffee With Karan chilling with the tinsel town stars. Alia Bhatt considers him a mentor since he has launched the actress and she's currently shooting for his film, Brahmastra. Karan is also friends with Alia's beau Ranbir Kapoor, who is also in the same movie. 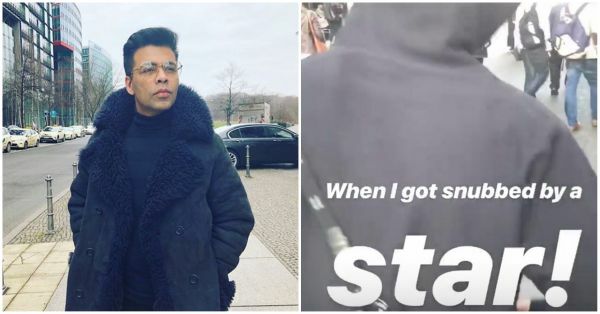 It seems like Ranbir isn't very happy with the filmmaker chasing him like a pap in Bulgaria and he totally snubbed him in an Insta story shared by KJo. All in good fun! The angry young man look definitely suits the Sanju actor. The second shoot schedule for Brahmastra just ended and a few days ago, we saw the trio, Ranbir Kapoor, Alia Bhatt and Ayan Mukherji celebrating post the wrap. Alia is now back home in Mumbai while Ranbir is still having a ball in Bulgaria with all his buddies. He was spotted in a cafe with Ayan Mukherji and a crew member. Rumour has it that Ranbir will be flying back to Mumbai to attend Mahesh Bhatt's 70th birthday party. The families have given a thumbs up to their relationship and now Ranbir will be introduced to Alia's extended family officially.